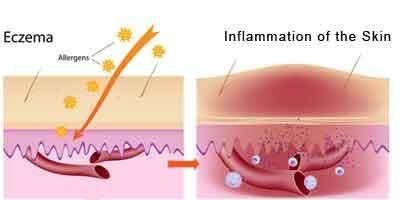 A new treatment approach for eczema? Eczema affects about 17 percent of children in developed countries and is often the gateway to food allergy and asthma, initiating an “atopic march” toward broader allergic sensitization. There are treatments including steroid creams and a recently approved biologic but they are expensive or have side effects. According to a new study, a different approach to eczema, one that stimulates a natural brake on the allergic attack has been suggested.The new study has been published in Science Immunology. Yet, if you examine an eczema lesion, the numbers of Tregs are unchanged. Interestingly, Tregs comprise only about 5 percent of the body’s T cells, but up to 50 percent of T cells in the skin. “Our question was, is there something special about the Tregs that reside in the skin?” says Raif Geha, MD, chief of the Division of Immunology at Boston Children’s Hospital and the senior author of the study. Geha led an investigation using two separate mouse models of eczema, each recreating a separate pathway leading to allergic skin inflammation. The team purified Tregs from the animals’ skin and blood and compared the genes they express. Geha now wants to see if RORα is expressed less in human eczema and whether it’s important in the atopic march. If so, he sees several possible treatment approaches. One is to boost RORα’s level or activity with compounds that act as RORα agonists, perhaps given in a topical cream. Geha’s lab also plans to look for factors in the skin that drive RORα activity, which could present other targets for intervention. Finally, the study showed that RORα regulates the expression of several genes important for Treg cell migration and function; those pathways could be potential targets too.